While the ability to see things in a new way isn’t always easy, what follows are 50 intriguing ideas that will act as your guide and inspiration as you beautify your home landscaping. Using an array of spring blooms in shades of purple and white, these redwood boxes create a vertical garden with fresh, clean lines. Staggering the height of each box when attaching them to the wooden fence creates a backdrop that achieves strong visual impact without sacrificing its pleasing simplicity. Perfect for maximizing space in small gardens, for use as a screen to block unwanted views or as a way to section off a large back yard by creating an intimate space. 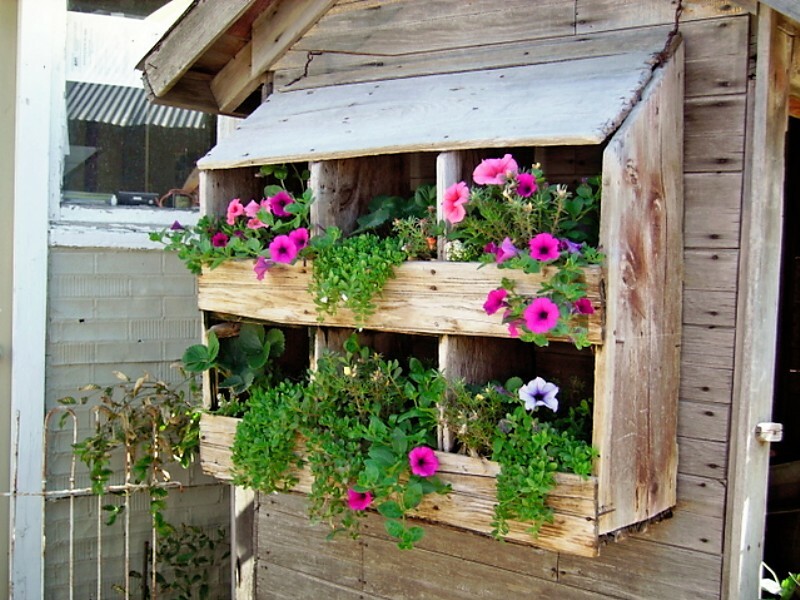 The flowers can be rotated seasonally or the boxes can be planted with annuals that will bloom throughout the spring and summertime. Achieving a vertical garden design without sacrificing the view of what’s behind it is part of the beauty of this clever design. Inexpensive chicken wire is attached to strong supports that mimic the architecture of a trellis. Clay pots attach with a metal hook and make mixing and matching the layout a simple matter. Plant succulents, ivies, ferns and geraniums, or fill each pot with a kitchen garden’s worth of herbs for a display that is beautiful and practical. Accent the edge of a patio or create a dramatic entryway near the front door. 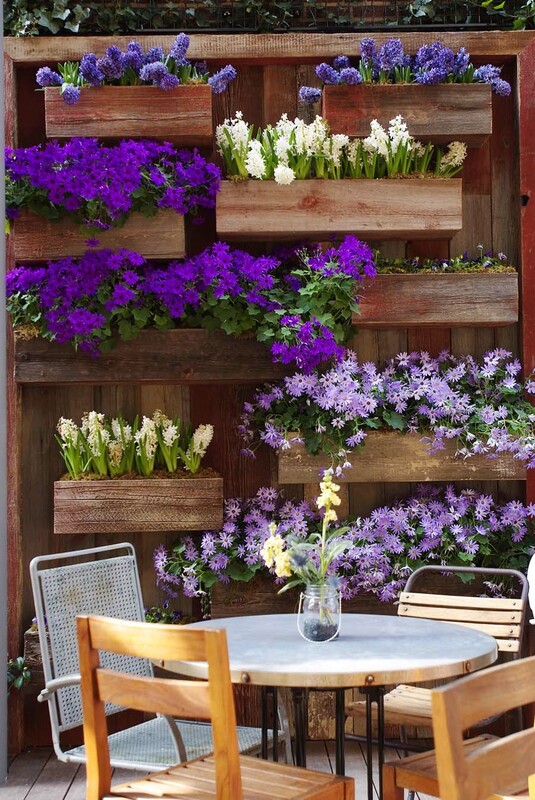 Jazz up a bland and boring space by closely stacking planter boxes in bright colors. The overall effect causes the eye to move upwards, creating visual appeal and imparting interesting texture and color. 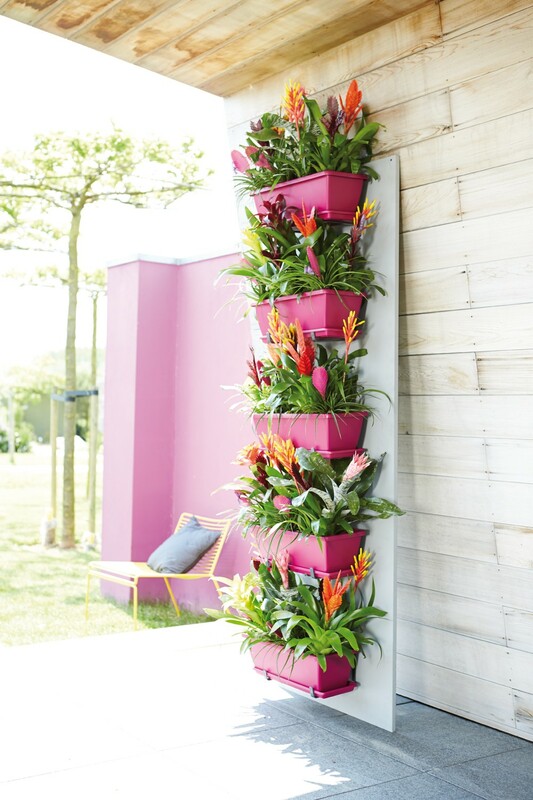 The choice of vivid bromeliads gives a warm, tropical feel to this home design. The boxes are attached to a board that’s painted in a neutral color, adding stability while not detracting from the impact. 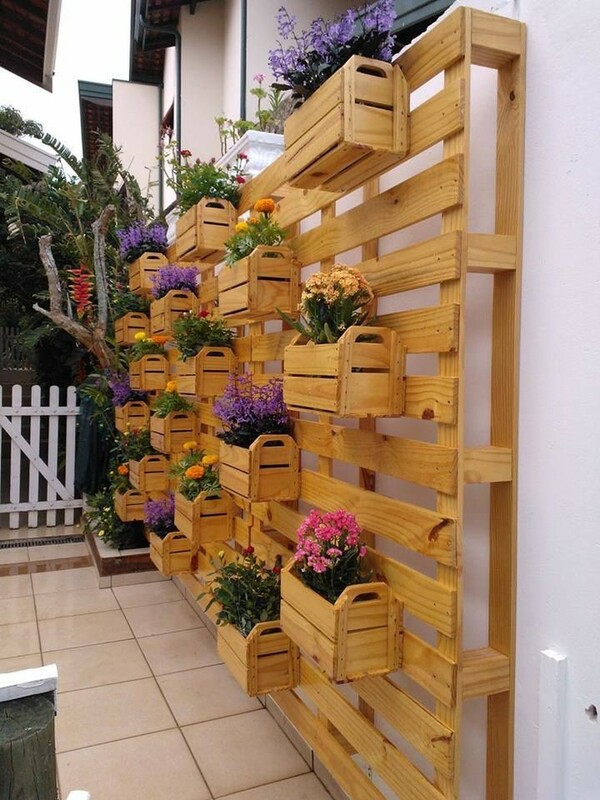 This wall garden would create a welcoming atmosphere when placed next to an entryway or add a touch of nature to the wall of a garden shed. To really dress up a space and give it undeniable wow factor, consider planting a profusion of leafy varieties in close proximity. Then end result is a kind of green waterfall of varied leaves that provide an irresistible texture. The base of the design is edged with neutral bricks and encloses a moss garden punctuated by stones and small plants. Part of the success of this design is in the use of subtle shades of color from the leaves themselves. For a space needing a dramatic focal point, this design creates a commanding presence and would look especially pretty in a courtyard. Consider painting with plants using this whimsical design. 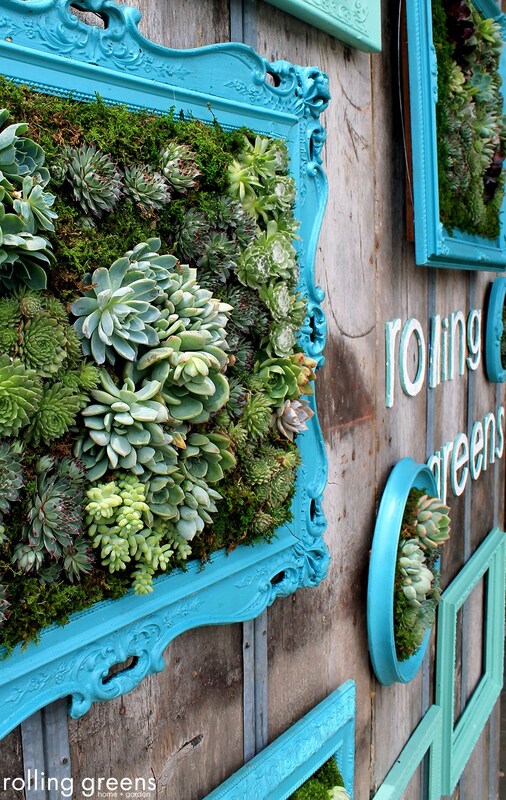 Elaborate picture frames in bright colors highlight the muted colors of succulents planted in close groupings. Any gaps in the planting are plugged with bright green moss, creating a variety of textures and strong visual appeal. This design can be used indoors or out, and the choice of succulents is a practical one, as they grow very slowly and require less water than some plant varieties. While this design works well alone, consider grouping three or more frames in different sizes and shapes for a striking wall collage. Nesting boxes for chickens in a former life, this planter brings the patina of age and a warm, primitive feel to this vertical garden design. Each nook holds bright blossoms and trailing greenery, bringing a touch of nature to any wall space. Using found objects in unexpected ways adds interest to a home design scheme and helps the environment by recycling unwanted items. Mounted on a garden shed, dressing up a bland space or incorporated into a larger patio design are all options for this versatile idea. 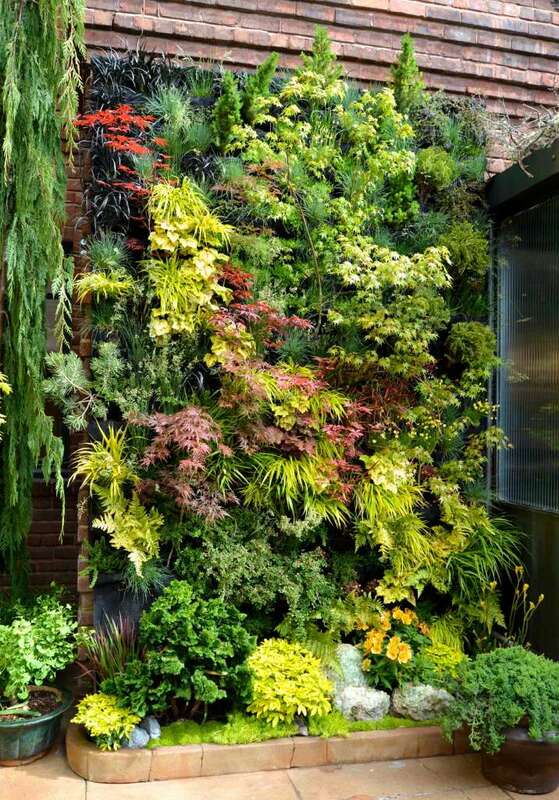 This tiny vertical garden makes a big impact thanks to its artful use of color. Alternating shades in pastel colors give a pleasing uniformity, while tiny flowers and leafy vegetation peek out from the tops of the terracotta pots. This design can be utilized to perk up an old fence or the same configuration installed on the side of a house will add a subtle artistic flair. This design could also be used indoors, perhaps in a kitchen, as a way to keep culinary herbs close at hand. 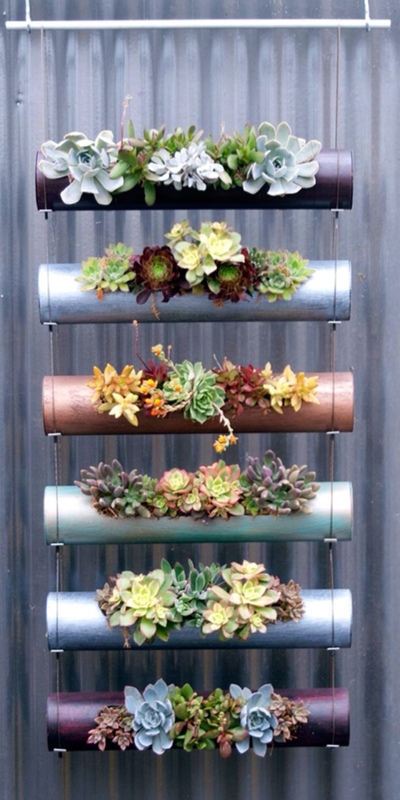 Lengths of metal pipe in contrasting colors create a juxtaposition of industry and nature when succulent plants are added in varied hues. 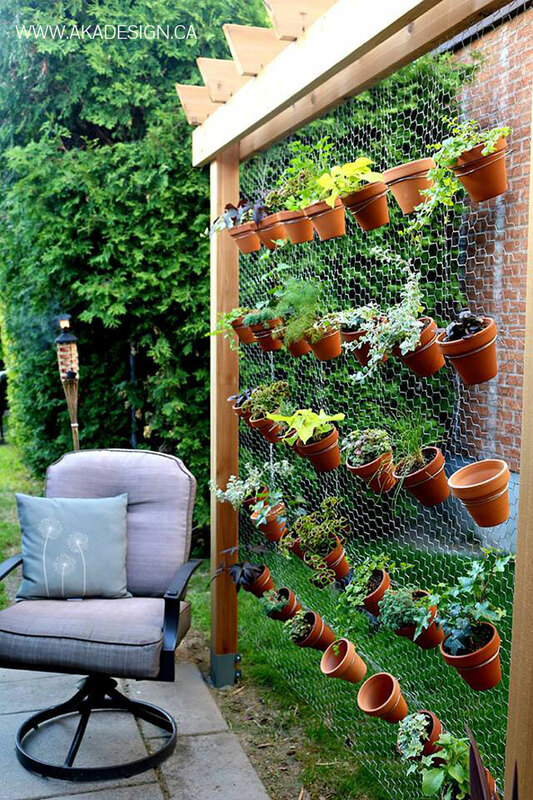 Thin metal wire connects each planter, adding stability while also creating a ladder-like effect that draws the eye upwards. Perfect for a home design with a minimalist theme or as a way to bring the outdoors inside when planning to accessorize modern architecture. While the use of succulents is a popular choice due to their minimal requirements, creeping plants like ivies, wandering Jews or spider plants would also be pretty. A by-product of stacking inventory in warehouses, pallets represent an inexpensive and plentiful building material for the vertical gardener. 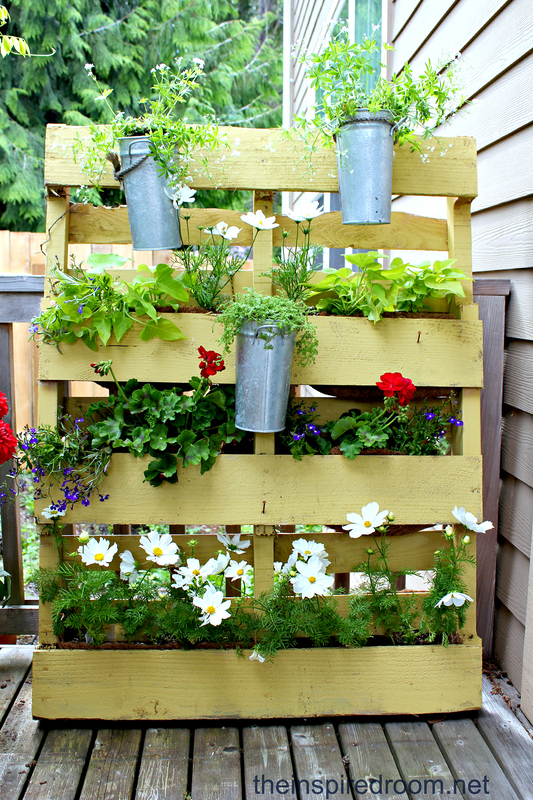 Painted in pretty colors to match a home or garden structure, pallets can be used as planter boxes by standing them upright and adding a base for holding flower pots. Grow flowers to beautify a small space or load each row with edible plants such as cherry tomatoes, basil or varieties of lettuce. Spending just an hour or two preparing this recycled item can yield lasting benefits. These planters can be used singly or grouped together to accent a larger space. This living sculpture is at once both strikingly modern and appealingly primitive. The complex interplay of wood, moss and tiny succulents creates a fascinating tableau that catches the eye again and again. 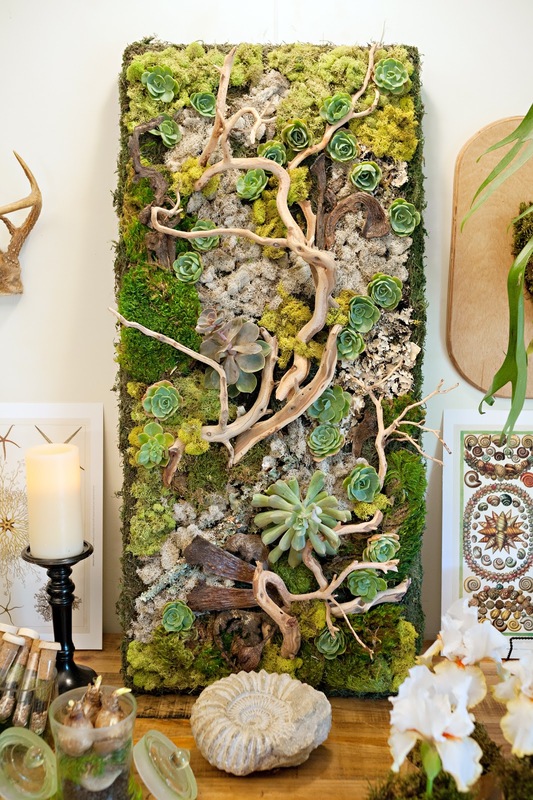 While this panel would work perfectly in a home as a piece of art for use on a wall, it would work equally well in a sun room or on a porch, where the vibrant textures of this miniature vertical garden will add a natural aesthetic. Plant the greenery in a metal tray, adding driftwood and moss for interest mist gently to keep it green and thriving. 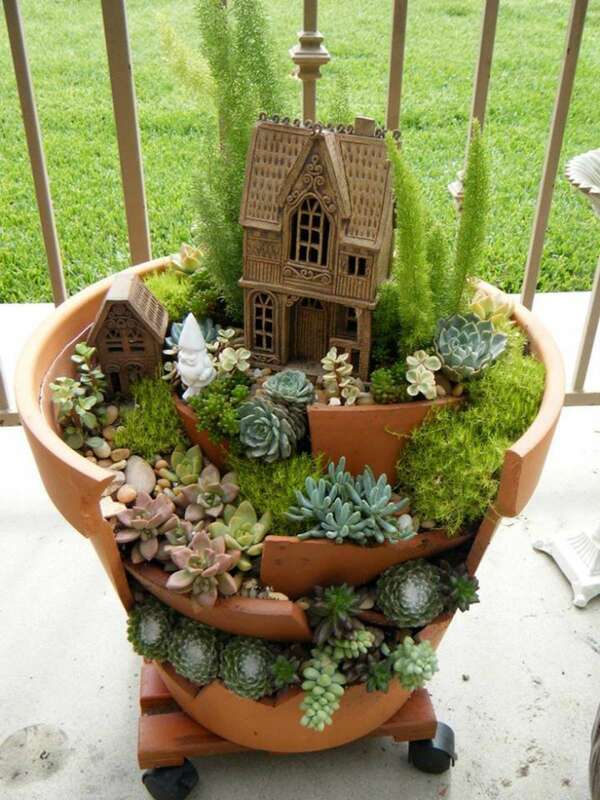 The recently popular trend of creating a fairy garden in the yard is taken to vertical heights with the clever use of broken pot shards. Staggering the shards and holding them in place with firmly packed soil gives it the tiered look of a tiny retaining wall and allows space for miniature succulent plants to grow. Whimsical fairy cottages complete the look, along with small plants meant to resemble full-sized trees. While this look is especially appealing to children, the playful nature of the design will bring a smile to any face. Placing the pot on a wheeled base makes for easy maneuvering on a patio or porch area. This fresh reimagining of a kitchen spice rack uses repurposed Mason jars to plant a host of useful herbs. Lining each jar with a handful of pebbles before placing the soil ensures the roots will not get too soggy. Attach the jars to attractive boards, like these weathered fence slats, and write the name of the herb in chalk for a completed look. 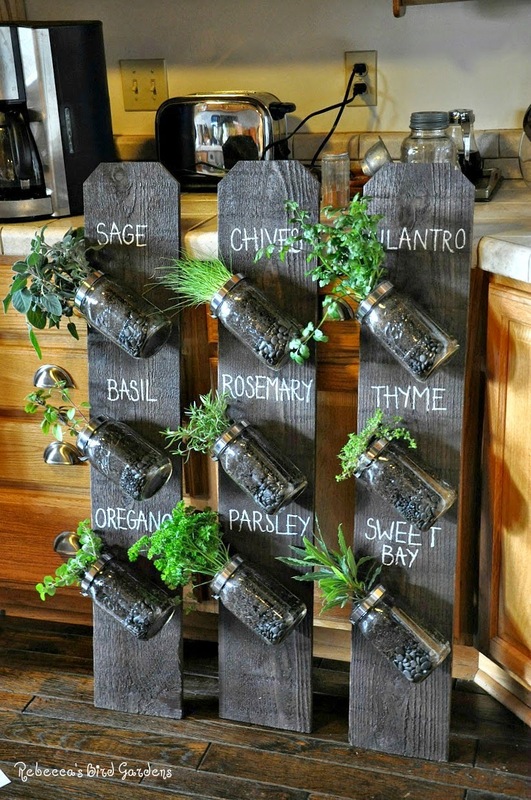 Fresh herbs are potent and contain nutrients lost during the drying process, making this vertical garden a charming and practical addition to a cook’s kitchen. Hang on a wall or prop the completed project on the floor for a variety of different design looks. Blank walls crying out for ornamentation receive beautiful treatment with a facade created using fresh lumber. Matching wooden baskets hold blooming plants in a variety of colors, with the neutral background showing them to best advantage. 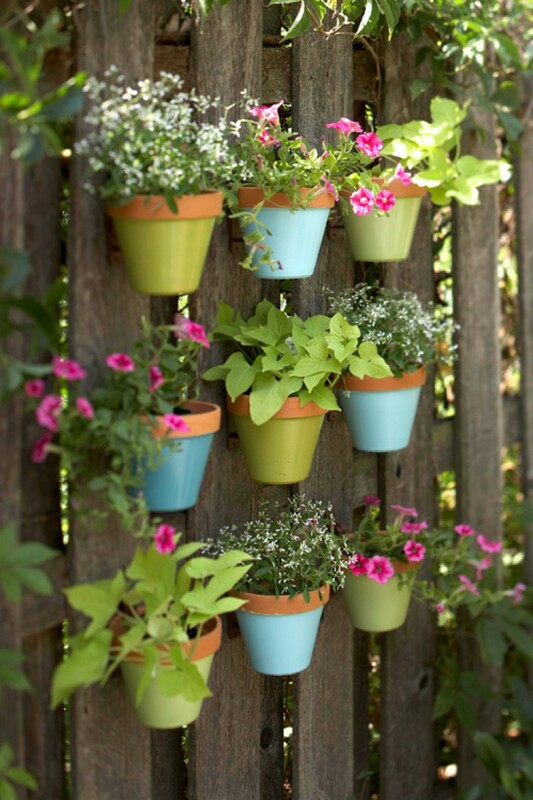 An ideal way to cover a large section of exposed wall space, the boxes can also be used to grow herbs or salad items. Trading out blooms to match seasonally available plants will keep the display looking fresh. 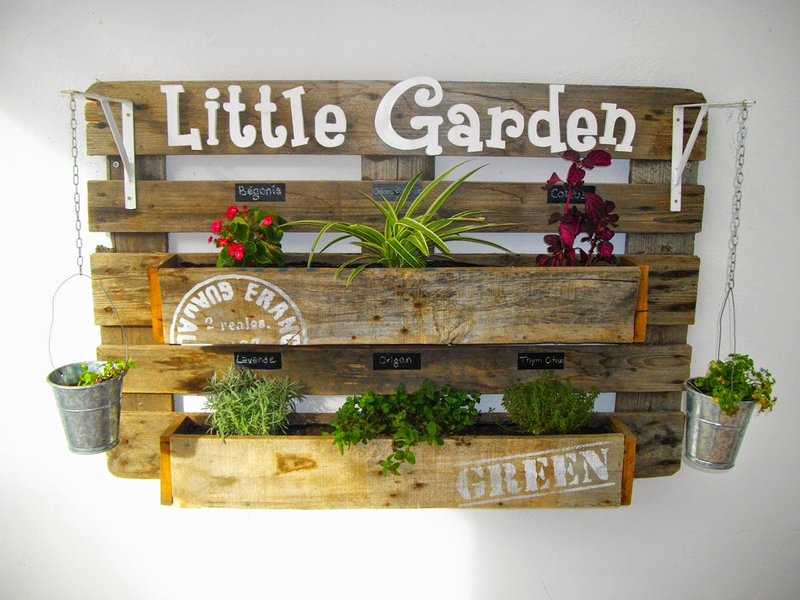 Repurposed wood from an old crate creates a sturdy backdrop for matching shelves that hold tiny plants and herbs. Two L-brackets on either side support charming tin buckets suspended from a chain. Add labels to identify each plant species and enjoy this tiny garden in a sunny spot indoors or hung on a porch or patio. While it can hold herbs useful in cooking, it can also showcase pretty blooms for a bright pop of color, making it a valuable addition to home decor.